COTTESLOE - The sandy beach of Cottesloe, a town not that far away from Perth. Cottesloe is well known for its 'Sunday Sessions', unfortunately I wasn't there on a Sunday. 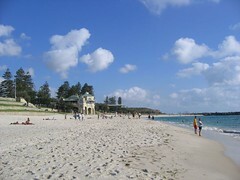 I spend an afternoon on Cottesloe beach. It was rather a coincidence that I was in Cottesloe. The day before I was in Fremantle and as I had missed the boat for Rottnest Island that morning I decided to stay on the beach in Perth.